In the last week of August, during my trip to Lucknow, I had organized a Fursat Chaat Walk. The idea was to take people around to places that define chaat in Lucknow; places that are not well known among tourists, but are thronged by locals; places that have been around since past 100 or so years. My dad – who’s been born and brought up in Lucknow – chalked out the map for the walk and picked places where he used to eat as a kid and in college. Before I go ahead and tell you more about the chaat places that we covered, let’s talk a bit about the walk/drive; yes, it turned out to be a mix of both. My friend, blogger and now a successful food entrepreneur Amrita Rana joined in from Mumbai and we were accompanied by a few members of Lucknow Chefs (a local Facebook group). And…ehm…the walk was covered by the reporter of The Navbharat Times. 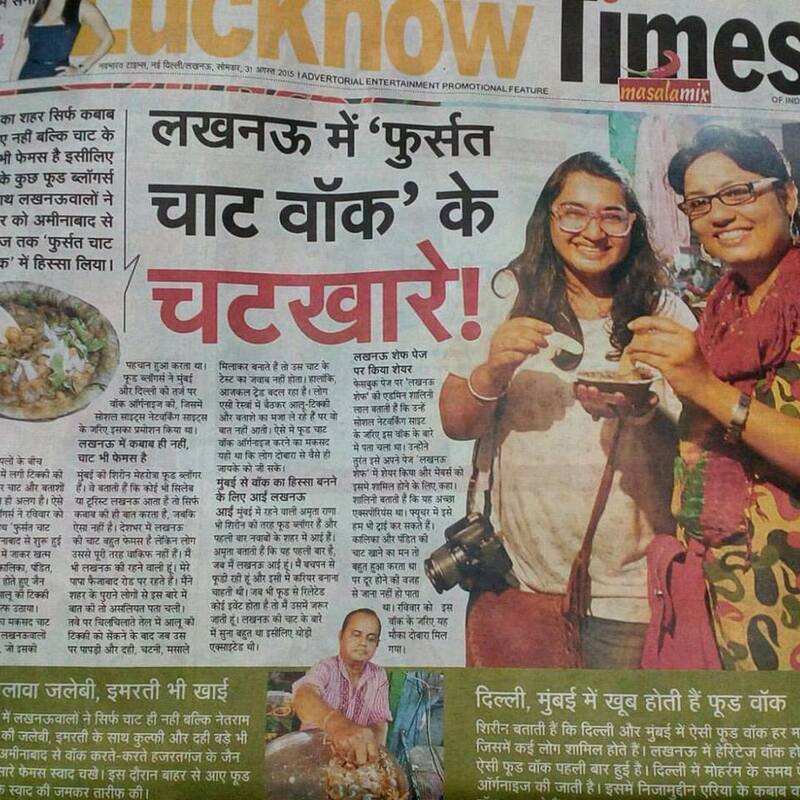 See, that’s Amrita and I on the front page :D.
Lucknow’s streets are dotted with small chaat shops and every area has its favourite. We picked four places that have stood the test of time. Located in the corner of Naaz Cinema Chauraha in Aminabad, this is one of the smallest and oldest chaat shop in the city. The shop is manned by Naresh Gupta who is the fourth generation owner; yup, it’s that old. Almost everything is a must try here especially their papdi chaat with sweet and tangy chutney, mashed potato and matar. The tiny batashas are crisp and you’ll just love that tangy, spicy water. Also try the matar ki tikki which is mashed white pea fried like a tikki and garnished with lime juice, coriander and ginger. If you’re lucky, you’ll get gulab jamuns too, please don’t leave without eating them. Tiwari ji’s shop was the next shop. The Mumbai janta will be happy to know that Juhu’s Tiwari Brothers are related to him. This is another old shop which is now divided; you must go to the one on your right when facing the shops. Start with pani ke batashe; they have pani in four flavours and the hing one is just brilliant. 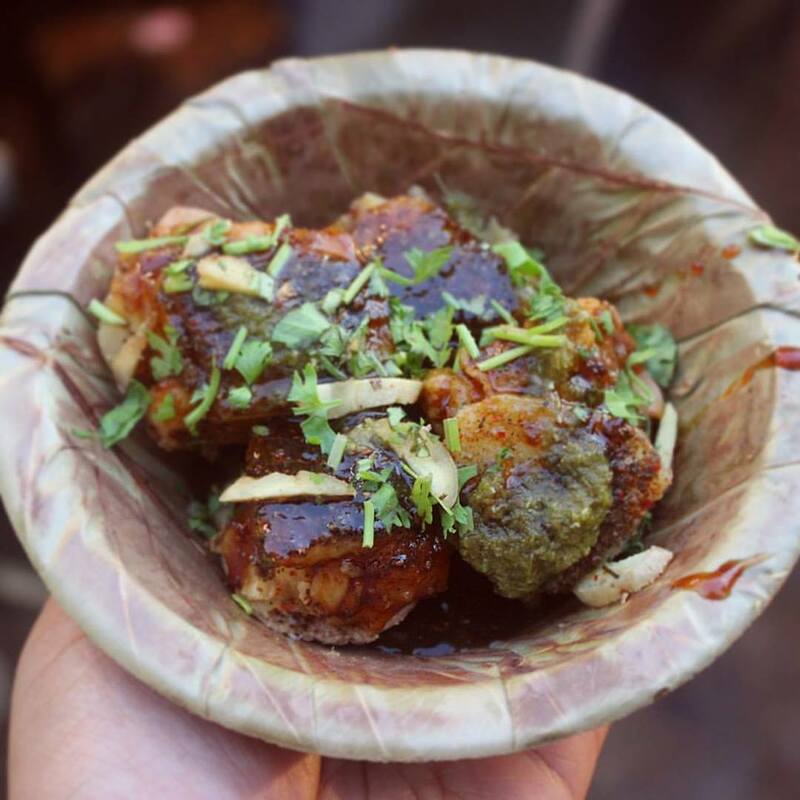 Move on to their palaki – palak patta chaat where palak is coated in thin besan batter, deep fried and topped with dahi-chutney. 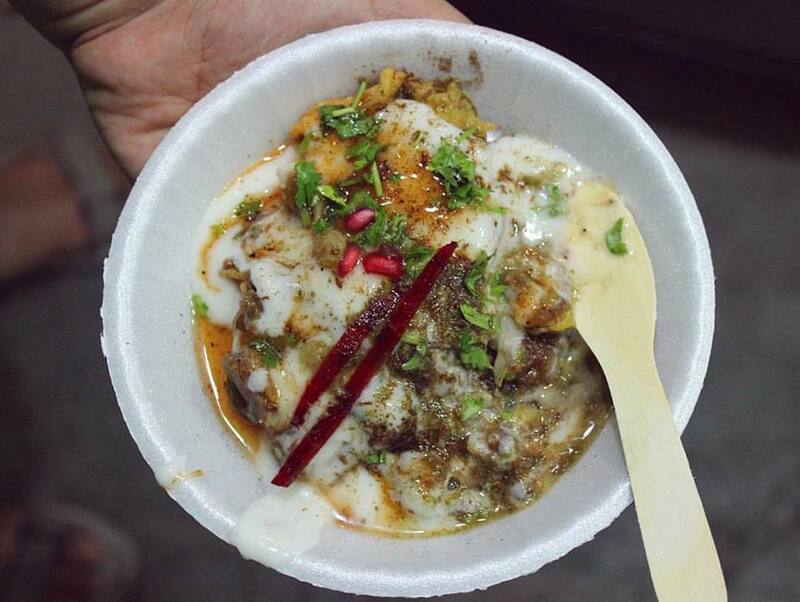 Wrap it up with dahi wada – they make the best in Lucknow. Next stop was a little ahead Tiwari’s. Sharma ji’s small, unassuming shop is around 40 year old and has chaat that’s absolutely brilliant. We were treated like royalties here and the owner himself made us taste the papdi, beautifully layered aloo tikki (to our surprise, the potato was smashed and fried instead of shaped like a tikki), matar ki chaat and pani ke batashe. We reached this place at 8.45 and the tawa was full of aloo tikkis, by 9.15 everything was wiped clean and a board saying ‘sold out’ was put up. So you know what to eat here and why it is so famous. They also make beautifully soft dahi wada and matar ki tikki. Be there before 9pm at any cost. Now, here’s a bit about Lucknow’s chat – if you want to eat the best chat, don’t worry about how big or small the place is. These places wouldn’t be super hygeinic, but if you have a decently strong digestive system, you will survive. Also, don’t expect tables or chairs at any place except Tiwari’s. Ama yaar, chat bhi koi baith ke khane ki cheez hai?